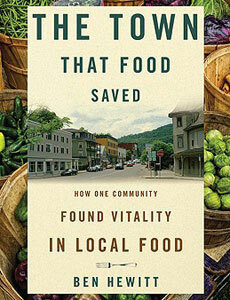 This book looks at the rural town of Hardwick, Vermont and their approach to a local food economy. This is not a rich town, but one of blue collar workers who do not eat soy for breakfast and are suspicious of neo-hippie sustainability ideas. However, they are striving to reach a sustainable model that can feed the town on what is produced locally. Who knew the importance of seeds to the future of America? The characters in this book do, and are excited about sharing their knowledge with the world. This book explores how the town focuses food on the economy and community, allowing for job opportunities and increased involvement from its citizens. I learned a lot about what it meant to run a community business as the co-op and café were helped out by volunteers who enjoyed the chance to catch up with others in the store as well as enjoyed food. My understanding of butchering your own food or having local butchers do it was deepened to a level where I began to think it possible for each town to have their own team who drives around in a pickup truck and will come over slaughter your pigs and give you a good recipe for liver. This book is important because it has a different angle then other popular books on food. This addressed the much needed focus on communities that do not already want better food. This is a book that is not about how to change the look of production but how to improve community’s production. Here is a story that is a must read for all those interested in food, local-isms and sustainability. This book made me want to start a seed farm, a butcher business and a co-op café over the short time span it took me to read. I however would not recommend this book to those whom you wish to inspire love of food in. This is a book that will refuel your interest in local foods but it will not start a fire. Overall I would give this book a 7 out of 10 on the scale of good read with good information and good food.